The DOI valid immediately and active withing 2 days. A DOI identifies an object permanently, even if the object changes its location, its owner or other characteristics. The DOI does this through redirection, using the Handle system. The DOI enables the citability data object stored on SMIR. This permanent identifier (URL) takes the user to the current version of the relevant web page. The DOI's and meta data are registered with DataCite and are available for search. The DOI name can be resolved using the DOI Lookup or by prefixing http://doi.org/ to the DOI name. A correct DOI link looks like this http://doi.org/10.22016/smir.o.217900 and resolves to the SMIR object with ID 217900. The object's metadata will be publicly accessible. 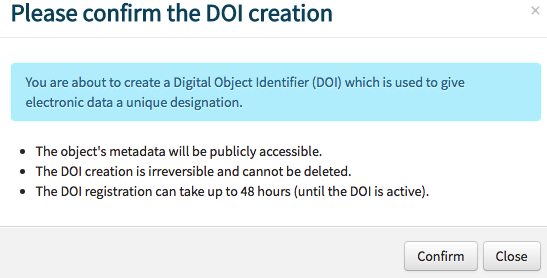 The DOI creation is irreversible and cannot be deleted. Creating a DOI does not affect download permission. You only expose the meta-data (Details page) to the public. A creatd DOI button is visible for all published objects. Use it to request a DOI. SMIR creates a valid DOI. Visible in the File Information Section.